After all that talk about coconut and it's amazing health benefits in my previous post, I thought I should share this utterly delicious coconut rice. Enjoy! Heat oil in a medium sauce pan over medium heat. When oil is hot add ginger, garlic and fresh green chilies and stir fry for about 1 minute. Add rice and stir fry until all rice granules turn white. Stir in salt, coconut milk and water. At this point you can transfer the mixture to rice cooker and finish cooking, Alternately, bring the rice mixture to boil. Reduce heat to lowest setting. Cover with a lid and cook for about 20 – 25 minutes until rice is done. Let it rest for 10 minutes. Fluff up the rice with fork. Transfer to a serving platter. Garnish with dry fruits and nuts and serve. *Recipe is adopted from my new cookbook, Trader Joe's Simply Indian. 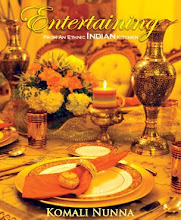 Trader Joe's Simply Indian (both printed and kindle version) is available to buy at Amazon. 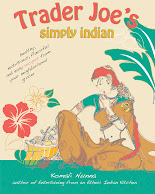 Trader Joe's Simply Indian is a compilation of gourmet Indian recipes made from fresh and ready to use ingredients available at Trader Joe's. that looks so bpretty colorful and sounds yummy. Thank you for the recipe.